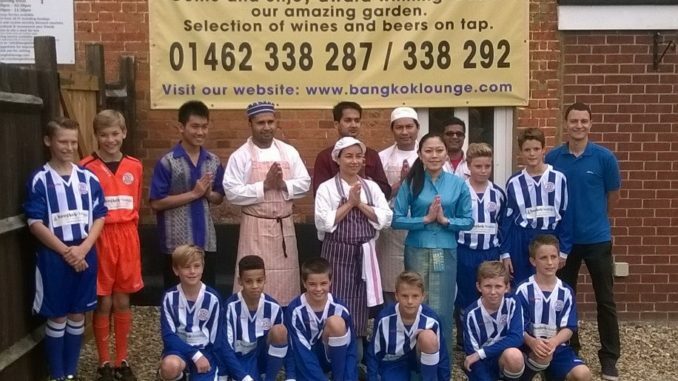 Bangkok Lounge Shefford, the award-winning fine Thai dining restaurant, has confirmed its sponsorship of the current Under 13 Reds squad as they move to U14s next season, at local football club Shefford Saints Juniors FC for the third consecutive year. The restaurant will once again be the main matchday kit sponsor for the club’s U14s first squad next season. Darren Coles, chairman of Shefford Saints Juniors FC, said “We’re delighted that Bangkok Lounge will be sponsoring our club again next season. Shefford Saints Juniors FC promotes healthy recreation across our community. Bangkok Lounge is a big part of this community, so we’re looking forward to working with Motin and his team again over the coming season. “The sponsorship renewal comes as Shefford Saints Juniors FC celebrates the end of an exceptional season – its 27th. This season saw the Bangkok Lounge sponsored U13s team move into the Chiltern Youth Sunday League, widely seen as the highest competitive level in the area, in order to further develop the players. The squad will formally confirm the continuation of the deal at its annual presentation weekend, which takes place 11th and 12th June. Occupying an historical building dating back to the 1600s and sitting on the banks of the river Flit, Bangkok Lounge Shefford prides itself on the originality of its genuine Thai menu. All dishes are prepared from fresh ingredients such as herbs, fruits and plants native to Thailand. Chefs at the restaurant further enhance these unique dishes by making them to each individual’s own personal taste. The restaurant allows diners to enjoy its exquisite cuisine al fresco in the warmer months or in the ambience of its authentic Thai interior all year round. Bookings are not always essential, however it’s worth calling in advance on 01462 338287 or 01462 338292 or emailing info@bangkoklounge.com to check table availability. The restaurant has its own large free customer car park. Bangkok Lounge won the St Albans District Chamber of Commerce Community Business Award in 2009 and was a runner up in 2010. Bangkok Lounge Shefford is at 2 Bedford Road, Shefford, Bedfordshire, SG17 5DJ. The company also has a restaurant in Harpenden, Hertfordshire.